Vishnu Wagh is an artist first, then a politician. He also paints Ganapati idol every year. He lives at Bambolim, his native village is at Dongri, on the inside road from Pilar to Old Goa. 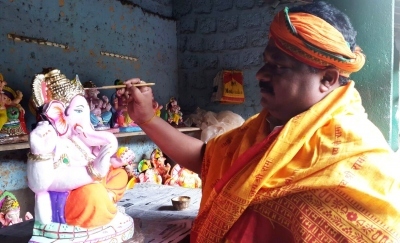 But he goes as far as a remote village of Bimbal in Sattari, to paint the Ganapati idol. 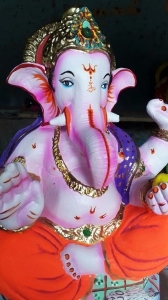 “This has been my ritual every year to go to Bhave Kaka’s Ganapati Chitrashala and paint idols. I was little late this year”, Wagh told goanews.com. But his Bhave Kaka’s sons – Prakash and Bhali – had left one idol unpainted, with a confidence that he would come to offer his services, as usual. Wagh went today, two days prior to Chovoth, and painted the idol. “I went and offered my Seva. I am feeling relieved”, said Wagh. This is once in a year, but Wagh writes series of full-page articles every week for Navprabha, a broadsheet Marathi newspaper of Navhind Publications. His articles are not mere opinions, but studied pieces – may it be on the history of Goan theatre or Goa’s changing culture, from ancient folk to modern culture. Amidst his political activities, the chairman of Kala Academy keeps posting his poems, sometimes intense on inner feelings disturbing him or some instant poems on the current situation, on WhatsApp groups. He is an active member of two literary groups on WhatsApp – Lekhak group of Goa and Kavya Chaudi of Maharashtra.